On January 26 Syrian government advisor Bouthaina Shaaban asked Wolf Blitzer, a propagandist for Washington and the Israel Lobby, on US TV why the US government, speaking through Secretary of Stare John Kerry, has the right to decide who is to be the government of Syria instead of the Syrian people. [Polls show that Syrian president Assad's approval ratings exceed those of every Western leader.] Even the slimy Blitzer wasn't slimy enough to answer, "because we are the exceptional, indispensable people." But that's what Washington thinks. Ukraine has a democratically elected government, but Washington doesn't like it because Washington didn't pick it. The Ukraine or the western part of it is full of Washington funded NGOs whose purpose is to deliver Ukraine into the clutches of the EU where US and European banks can loot the country, as they looted, for example, Latvia, and simultaneously weaken Russia by stealing a large part of traditional Russia and converting it into US/NATO military bases against Russia. Perhaps Putin, an athlete, is distracted by the Olympic Games in Russia. Otherwise, it is something of a puzzle why Russia hasn't put its nuclear missiles on high alert and occupied the western Ukraine with troops in order to prevent Ukraine's overthrow by Washington's money. Every country has citizens that will sell the country out for money, and western Ukraine is overflowing with such traitors. As we have seen for decades, Arabs and Muslims will sell out their people for Western money. So will western Ukrainians. The NGOs financed by Washington are committed to delivering Ukraine into Washington's hands where Ukrainians can become American serfs and this integral part of Russia can become a staging ground for the US military. Of all the violent protests that we have been witness to, the Ukrainian one is the most orchestrated. On February 6, Zero Hedge, one of the intelligent and informed Internet sites, posted a leaked recording from the despicable Victoria Nuland, an Assistant Secretary of State in the Obama Regime. Nuland is caught discussing with the US envoy to Ukraine, Geoffrey Pyatt, Washington's choice for who heads the next Ukrainian government. 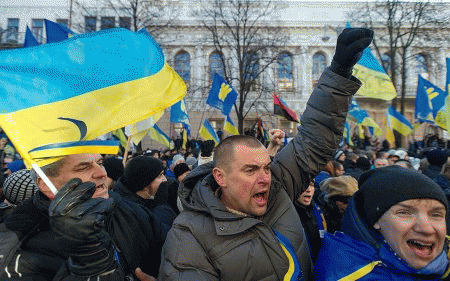 Nuland is incensed that the European Union has not joined Washington in imposing sanctions on the Ukrainian government in order to complete Washington's takeover of Ukraine. Nuland speaks as if she is God with the God-given right to select the government of Ukraine, which she proceeds to do. The EU, as corrupt as it is by Washington's money, nevertheless understands being made rich by Washington is no protection agains Russian nuclear missiles. Nuland's response to Europe's hesitancy to risk its existence for the benefit of US hegemony is: "f*ck the EU." So much for Washington's attitude toward its captive allies and the peoples of the world.